No confusions possible when in breeding plumage. 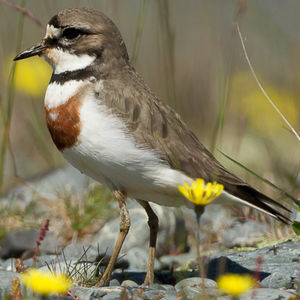 It looks like a classic plover, the upper parts are brown, the throat, underparts and forehead are white. The latter is highlighted by a thin white line at it upper limit for the males. There is a very fine and subtle white line at the back of the eye, a dark collar (more so in males, more brown in females). The male's breast is barred by a wide rufous band, the female's bar being thinner and paler. 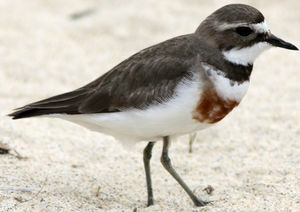 Young and adults in no-breeding plumage can be confused with other plover species as the black collar is nearly absent and their is no rufous bar on the breast. A powerful "pit" and a quick rolling "chee-ree-e-ree". This is a New Zealand endemic that frequents water edges, whether coastal or lake shores. Like the Little Ringed Plover (Charadrius dubius), it sometimes can be found in shingle or sand extraction sites. In the South Island, there is a population that breeds in alpine and sub-alpine (above 600 meters), usually far from water bodies. When not breeding, it also frequents pastures, golf courses and airfields. 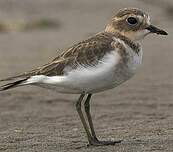 Double-banded Plovers is the only New Zealand wader for which part of the population leave the country during winter: part of the South Island alpine breeding birds migrate to the south-eastern Australian coast and Tasmania while others fly to the north of New Zealand. 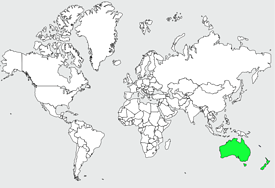 Individuals breeding at low altitudes or in the North Island remain in New Zealand. During the period between breeding seasons, the birds gather on sites where they feel secure: islets, spits, reserves. Some individuals defend wintering territories. 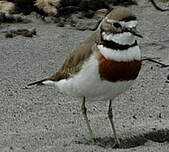 Double-banded Plovers eat mostly small invertebrates, but the young also eat small seeds and fruits. Double-banded Plovers forage both during the day and during the night. 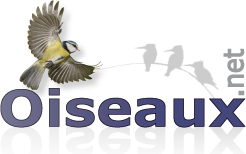 The breeding season spans from July to January, the alpine breeder being the latest. Pairs a very faithful to their territory and the young will usually breed close to where they were born. The nest is a classic example of plover nests, a small depression dug in the ground by the male and decorated with shells, stones and diverse debris. The female generally lays 3 eggs (but sometimes 2 or 4) the both parents will incubate during a month. The young will be able to fly some 35 to 40 days after hatching and will remain with their parents for a further fortnight. Some pairs manage two broods, but it is rare. 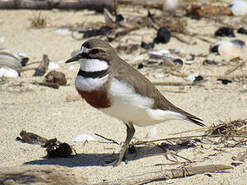 Double-banded Plovers do not seem to be threatened. The population is estimated at 50 000 individuals, of which 3/4 leave New Zealand each winter. 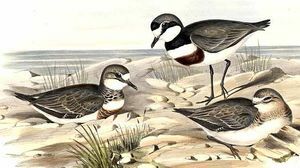 However, the Charadrius bicinctus exilis subspecies, endemic to the Auckland Islands (500 km south of the South Island) only has 700 individuals - there were only 100 to 200 in the 1970s after a steep decline in the 19th Century due to the introduction of cats and pigs.